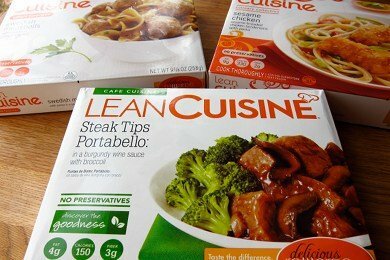 How Unhealthy Is Lean Cuisine? Lean Cuisine is a brand of frozen meals created by the Nestle corporation. How bad are they for you? Snack Girl has a new office and I share a lunch room with other tenants in the building. I have noticed a stack of "Lean Cuisine" boxes in the trash can. What am I doing looking the trash can? Good question. Anyway, I saw these and thought I should give them a try. At my local supermarket they were 5 for $10!! Wow! So, I bought three to sample the array of meals (see photo above). It just blows my mind that you can buy a prepared, boxed, and frozen meal for $2. My kid's school lunch cost $2.50. How does Nestle do it? Umm, that is not a lot for a meal. This meal breaks almost every one of Michael Pollan's food rules - too many ingredients, in a box, not local, etc. etc. But, for people who are broke, exhausted, and trying to lose weight - it is not a bad option. The sodium, of course, is out of control at 18% of your daily value. It tasted salty to me, but it tasted much better than I thought it was going to taste for $2. It was better than edible. Now, all of the other Lean Cuisines were meals such as meatballs and pasta, macaroni and cheese, and chicken and pasta. And, they lacked VEGETABLES. I think I would avoid those. They seem unhealthy because they all have high amount of sodium and low nutritional value. My advice is to pick the frozen meals with the most vegetables and the lowest sodium. Eat them when you don't have time to cook. Do you have a favorite frozen entree? Please share your thoughts on the healthiness of frozen meals. 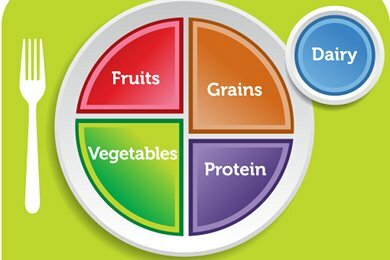 We used to eat them every day for lunch, the best part about them, for us, is portion control. We eat healthier for lunch now, but we do keep a few in the freezer for those nights when we are both exhausted, don't feel like cooking, and want to avoid fast food. 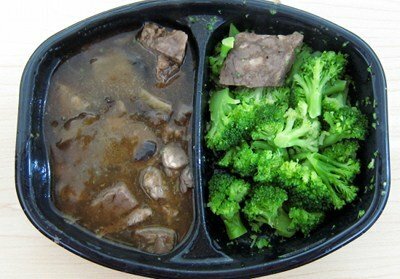 The Alfredo Pasta with Chicken & Broccoli is our favorite, though I do like the Steak Tips and Portobello too. I would love to see the list of ingredients and how many chemicals and preservatives are in it. I shiver at the thought. "Ingredients: BROCCOLI, SEASONED COOKED BEEF AND MODIFIED CORNSTARCH PRODUCT CARAMEL COLOR ADDED (BEEF, WATER, DEXTROSE, SOYBEAN OIL, MODIFIED CORNSTARCH, POTASSIUM CHLORIDE, SALT, POTASSIUM AND SODIUM PHOSPHATES, CARAMEL COLOR, NATURAL FLAVORS), WATER, PORTABELLO MUSHROOMS, 2% OR LESS OF BURGUNDY WINE, MODIFIED CORNSTARCH, MUSHROOM BASE (SAUTEED MUSHROOMS AND ONIONS, SUGAR, SALT, MUSHROOM JUICE CONCENTRATE, CANOLA OIL, 2% OR LESS OF BUTTER (CREAM, LACTIC ACID), ONION POWDER, MALTODEXTRIN, POTATO STARCH, NATURAL FLAVORS, HYDROLYZED WHEAT GLUTEN, CARAMEL COLOR, PARSLEY, GARLIC JUICE CONCENTRATE, ONION JUICE CONCENTRATE, SOYBEAN OIL, XANTHAN GUM), BROWN SAUCE FLAVOR (MALTODEXTRIN, TOMATO POWDER, SALT, SUGAR, YEAST EXTRACT, SOY SAUCE (SOYBEANS, WHEAT, SALT), BEEF EXTRACT, FLAVOR, CARAMEL COLOR, CITRIC ACID, LACTIC ACID, LYPOLYZED CREAM (BUTTER, NONFAT MILK SOLIDS, XANTHAN GUM)), SUGAR, NATURAL FLAVORS, BUTTERFAT, ROASTED GARLIC, DEHYDRATED ONIONS, CARAMEL COLOR, SALT, SPICES, CULTURED WHEY, YEAST EXTRACT. Contains: MILK, SOY, WHEAT INGREDIENTS"
FWIW, on Sunday afternoons/evenings, I spend about 30 minutes making a big batch of quinoa (a bag of uncooked quinoa is insanely cheap at our warehouse-club store) and washing the salt off a few cans of low-sodium black beans (I usually do this while the quinoa is simmering for 15 minutes and a big hat-tip to Lisa for the black-beans idea). When done, I dump a serving of each (1 cup cooked for quinoa and 1/2 cup of beans) into disposable/reusable containers so we can easily grab one for lunch/dinner. Eat them hot, eat them cold, add whatever you like (on mine, I love 2 tbsp salsa, cumin, mushed up avocado). I buy them when they are on sale. One of my favorites is the pumpkin ravioli but hard to fine in our area. I like the pizzas. Pizza is a problem food for me, so I can have it in a controlled portion. I too only eat them on occasion and keep them in the freezer for times when I am too tired or busy or for a quick lunch. Try to eat homemade food most of the time that is healthier. I used to eat them for lunch all the time while the price point is great and the easy factor is off the charts I do not like the sodium and I never felt full. That to me, the last two points are a fast food/junk food marker. Now for lunch I make things that are fresh like a beet, apple and goat cheese salad - fast, easy, fresh and I feel full and happy minus the sodium bloat. I don't care if they are 10 for 1 dollar - I will not purchase them. The sodium.....I just can't get past the sodium. Way too much in my opinion. I agree. They never fill me either. When I have them I supplement with an apple and a yogurt. All the more reason not to eat them at all. Homemade, fresh, healthy food is best. I've tried these before. They're like a snack - definitely not a meal. I never felt satisfied. Lean Cuisine has different lines of frozen meals. The Spa Cuisine line has more vegetables in them than the others. I think that Cafe Cuisine (which seems to be the line of your two non-featured selections) is more like portion controlled comfort food. I am with Heather on this one. I used to buy these ALL of the time too...I very rarely (if ever) purchase these anymore (and I am a Weight Watcher's girl)...Heather was right when she said they DO NOT make you feel full AT ALL...and you are right that if you buy them you need to buy the lower sodium ones....even those have WAAAAAAY too much sodium but that is the case with most processed foods. This is just the lesser of the evils. I LOVE Amy's meals...the tamale verde is amazing and very authentic tasting. Because they are organic, I feel better about eating them (don't have to worry about chemicals and GMOs). I think they all taste alike. And I agree they do not fill you up....at all. I used to put 1 cup of spaghetti squash with each entree which helps, but after awhile they all taste the same to me. I used to think maybe it was the sodium masking the flavor. But I am not a fan of frozen dinners. Skinny Cow ice cream, however is a different story. I love the cookies and cream but do not eat it often as it triggers bingeing for me. When I worked, I ate them everyday & supplemented it with a side salad from the cafeteria. Some (all brands) were good such as 3 Cheese Ziti (WW) & the breaded chix w/vegs. Some were vile and I stopped eating anything with chix chunks as they tasted artificial. Now that I'm home, I can only tolerate a few of them. I have, unfortunately, re-discovered cheap pot pies which fill me up! My Mom, who invented the word easy, never ate them because of the sodium level. Buyer beware. The problem was that when I worked, what I was in the mood for @ 7am, I wasn't interested in @ 1pm. A fresh salad always cured it for me! You could always buy a veg in a steam bag (I love broccoli) for lunch-filling & healthy! Thanks Andy for the Quinoa idea! I can make some today for the week! Also I find it interesting that a lot of comments about LC lunches said they had to supplement their meals with a side salad or something else that was real food. I eat LC with a homemade side salad. They are a great way for me to portion control. I don't eat a lot of salt in any of my other meals, so getting the larger amount at lunch is ok. As I get deeper in my weight loss and better at making healthy meals, I may change my mind. But for now, these are a great way to start on the right path. Lean Cuisine? Look at the ingredients. It's an "anti-food" Your body does not know what to do with that crap. 150 calories is not a meal it's a snack. For the same calories I can have a small apple and some raw almonds which is healthier and keep me satisfied a whole lot longer. I am about to have a pear and some raw almonds and I won't be hungry for hours. Fiber + Protein = Satiety. Well, with the LC pizza, which does satisfy my 8-months-pregnant pizza craving, I have figured something out. The whole pizza is 350 Calories, which IMHO is not "Lean," even if I have stopped counting calories religiously until my daughter is born. However, one must build a platform out of the box to cook the pizza properly, and the boxigami probably burns 30-50 Calories, placing it more into "Lean" territory. The pizza is so-so, but decent enough to satisfy a craving if you don't mind doing some amateur carpentry on your lunch break. Holy cow, that's a lot of ingredients for "beef and broccoli". hahaha. No go for me. It might have served as an "emergency" quickie (which is what frozen meals are for us, emergency, dang, there's no time to coo and we're pooped meals). AND IT HAS GLUTEN. Why the hell do they have to add gluten???? So, no go here.